Microsoft has supplied details on its plans for Microsoft Security Essentials (formerly referred to as Morro)—a free antivirus service for Windows. Do Symantec and McAfee really have anything to worry about? •Real-time protection. Microsoft Security Essentials uses real-time protection to help address potential threats before they ever have an opportunity to become a problem. •Dynamic Signature Service. In addition to taking advantage of daily signature downloads, Microsoft Security Essentials is able to validate suspicious files against newly identified malware in near-real time by querying the Dynamic Signature Service. Actions from unknown sources such as unexpected network connections, attempting to modify privileged parts of the system or downloading known malicious content all trigger requests for updates from the Dynamic Signature Service. •Rootkit protection. Microsoft Security Essentials includes a number of new and improved technologies to provide additional defense against rootkits and other aggressive threats. These technologies include live kernel behavior monitoring for monitoring the integrity of kernel structures, support for direct file-system parsing to help identify and remove malicious programs and drivers hidden from the file system, and improved live rootkit removal that dynamically loads a new kernel mode driver as part of the cleaning process so that it can help successfully remove some of the more advanced rootkits. •Lightweight design. Because Microsoft Security Essentials is core anti-malware only, it doesn't carry the weight of the suite products and has a much smaller download size. •CPU throttling. CPU throttling helps ensure that the user's system remains responsive to those tasks the user is likely to be performing such as opening files or browser windows, launching programs, editing documents, saving files, etc. •Idle-time scanning. Scans and updates are scheduled to run when the PC is idle and use a low-priority thread. •Smart caching and active memory swapping. Signatures not in use don't take up space in the available memory, making Microsoft Security Essentials friendlier toward older PCs as well as today's smaller, less powerful form factors. Essentially, Security Essentials seems a little bit like a lite version of Live OneCare (though it's technically not related). Since this version is free, it is certainly worth a shot—and it definitely poses a threat to Symantec and McAfee. Plus, they note that there will be no registrations or renewals and the software will be updated automatically. As far as availability is concerned, Morro will can be downloaded directly from Microsoft starting on June 23rd in a limited public beta for XP, Vista and Windows 7 users. As threats to the safety and security of today's PC users continue to evolve, Microsoft Corp. is actively working to help keep PC users protected so that they have a safer and enjoyable Windows experience. From building products that are more resilient to attack to delivering solutions designed to help secure the platform, Microsoft is committed to being a leader in providing consumers and enterprise customers worldwide with ongoing protection from new and existing threats. In addition to taking advantage of the security designed and built into its products, Microsoft also encourages consumers to use real-time anti-malware protection to help protect their PCs from new and evolving threats. There are many quality security products to choose from (both free and subscription-based); however cost and performance barriers prevent many consumers from using up-to-date security software to protect their PCs. 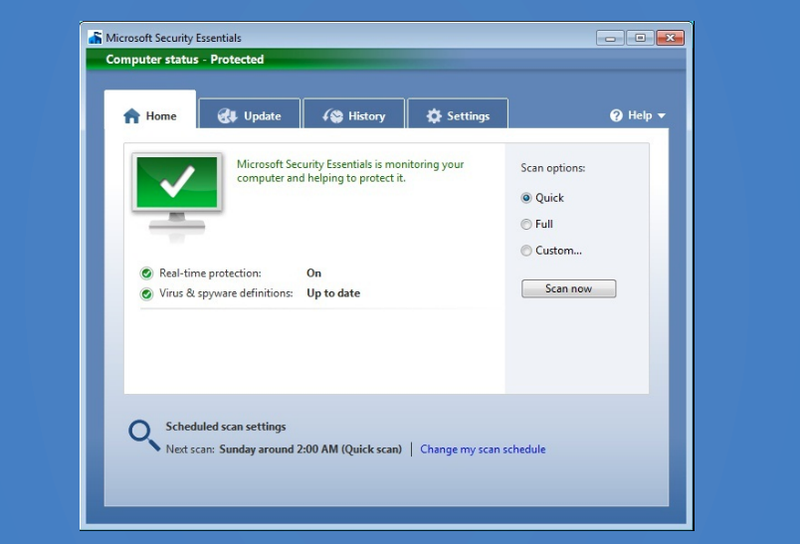 To address consumer demand for quality anti-malware protection that's easy to get and doesn't slow down system performance, Microsoft is introducing Microsoft Security Essentials, a no-cost anti-malware solution that provides consumers with quality protection from threats including viruses, spyware, rootkits and trojans. And because Microsoft Security Essentials is offered directly from Microsoft, consumers can have confidence that the software they download is legitimate and not rogue security software that can actually cause a PC to become infected with malware. Real-time protection. Microsoft Security Essentials uses real-time protection to help address potential threats before they ever have an opportunity to become a problem. Dynamic Signature Service. In addition to taking advantage of daily signature downloads, Microsoft Security Essentials is able to validate suspicious files against newly identified malware in near-real time by querying the Dynamic Signature Service. Actions from unknown sources such as unexpected network connections, attempting to modify privileged parts of the system or downloading known malicious content all trigger requests for updates from the Dynamic Signature Service. Rootkit protection. Microsoft Security Essentials includes a number of new and improved technologies to provide additional defense against rootkits and other aggressive threats. These technologies include live kernel behavior monitoring for monitoring the integrity of kernel structures, support for direct file-system parsing to help identify and remove malicious programs and drivers hidden from the file system, and improved live rootkit removal that dynamically loads a new kernel mode driver as part of the cleaning process so that it can help successfully remove some of the more advanced rootkits. Available at no cost. Because Microsoft Security Essentials is available at no cost, there is no need to go through a lengthy registration process or provide billing information. Direct download. Microsoft Security Essentials is easy to obtain online direct from Microsoft, meaning consumers can have confidence knowing they are downloading quality anti-malware protection from a trusted source. No registration, trials or renewals. Consumers can be confused by trials and annual renewals, in many cases believing they have up-to-date anti-virus protection when in fact they do not. With Microsoft Security Essentials, consumers can download the software without a cumbersome registration process and stay protected without the hassle of annual renewals. Up to date. Microsoft Security Essentials is automatically updated to help ensure that signatures, the anti-malware engine and the application are always up to date. New malware signatures are downloaded daily with new signatures accessed in near-real time through the Dynamic Signature Service when suspicious behavior is detected. Single-click fix. There is no guesswork required to keep the PC protected. When there is an issue requiring user attention, an action button appears in a prominent location on the notification with the suggested action, making it easy for the consumer to fix the issue with just one click. Lightweight design. Because Microsoft Security Essentials is core anti-malware only, it doesn't carry the weight of the suite products and has a much smaller download size. CPU throttling. CPU throttling helps ensure that the user's system remains responsive to those tasks the user is likely to be performing such as opening files or browser windows, launching programs, editing documents, saving files, etc. Idle-time scanning. Scans and updates are scheduled to run when the PC is idle and use a low-priority thread. Smart caching and active memory swapping. Signatures not in use don't take up space in the available memory, making Microsoft Security Essentials friendlier toward older PCs as well as today's smaller, less powerful form factors. An Internet connection is required for installation and to download the latest virus and spyware definitions for Microsoft Security Essentials Beta. Public beta testing for Simplified Chinese in China will be available later in 2009.